E HAVE just passed the annual memorial of St. Charles Borromeo (November 4), the liturgical celebration of which includes one of my favorite passages in the Office of Readings. Drawn from a sermon given by the eminent, reforming bishop of Milan during the last synod he attended, the passage is an encouragement to priests to practice what they preach. These questions could well figure into an examination of conscience, not only for priests, but for all who desire to pray wholeheartedly. The question of what a priest is doing in the sacristy before Mass is a particularly penetrating question, and its answer has a direct effect on the fruitfulness of his prayer. In an appendix of the Roman Missal, one finds a good selection of prayers to be prayed in the sacristy before and after Mass. They include the famous prayers of St. Ambrose and St. Thomas Aquinas, among others. Many saints and faithful Catholics have written similar prayers for the purposes of preparation and thanksgiving. Two years ago, I posted a series of reflections on the vesting prayers that may be prayed by the priest before Mass. Just last month, NLM posted scans of the Præparatio ad Missam and Gratiarum Actio post Missam cards that traditionally hung in many sacristies. as thou wast found under His Cross. as He was of thine. Remain in peace, O holy altar of God. I hope to return to you in peace. before the throne of Christ. I know not whether I shall be able to return to you again to offer sacrifice. that she may be the way to salvation and the light of the world. 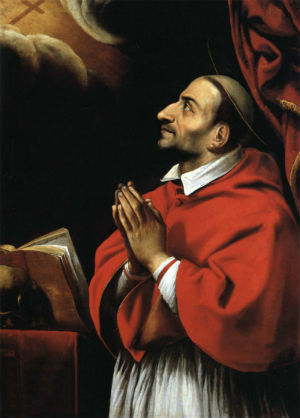 Following the encouragement of St. Charles Borromeo, may all of us remain solicitous to enter into the liturgy with attentive minds and hearts!